Designed for Coordinators of Community Events, Fairs and Festivals, this site is a an online booking tool and directory of professional entertainers who have experience performing shows for those events. Copyright © 2018-19 SeaSound Entertainment. All Rights Reserved. 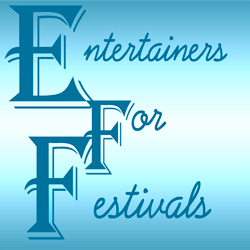 Entertainers for Events is a site developed for Event Coordinators to assist in planning and booking activities. Please provide as much information about your support request as possible in the form below, including Username and the page of the site where your question arose.